Howdy folks! Pauline here! 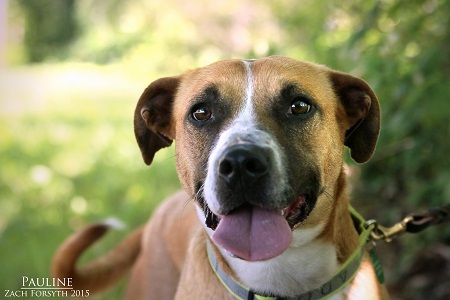 I am one rootin’-tootin’, treat slingin’, fun lovin’ girl who is ready for a new adventure. At only 2 years old I have a lot of exploring to do, I have never seen Multnomah Falls, or gone hiking up a mountain, and what’s this whole “beach” thing I keep hearing about?? It sounds like fun, don’t it?! As a Shepherd/Lab/Something/Something mix I have a loving heart and an energetic soul. And while I will love to join you on all these fun activities I will also be a great companion for movie night (especially action movies, have you seen Jurassic World yet? Dinosaurs are so cool!). I am wonderful with other dogs, best in a home without kitties, and since I can be a bit bouncy older kids are ideal. Do I sound like just the girl for you? Fill out the adoption application so we can schedule a meet and greet. I am fixed, vaccinated, and microchipped. My adoption fee is $250.